Explore the medicine chests and bookshelves of the everyday nineteenth-century American through a colourful array of advertisements, popular texts and much more. Uncover the history of ‘popular’ remedies and treatments in nineteenth century America, through primary source materials from the extensive collections at the Library Company of Philadelphia and the Philadelphia Museum of Art. The intended audience for these fascinating materials was the ordinary man in the street rather than medical professionals, with the focus on treatment at home using an array of inventive methods and fashionable techniques. Discover popular trends such as phrenology, herbal medicine and hydrotherapy, and the rise of widespread advertising by commercial manufacturers of medical aids. A wide-ranging collection of illustrated trade cards, advertising popular remedies. Popular texts written for the general public to educate them on treating their medical conditions themselves. Ephemera and business documents relating to manufacturing and advertising. Writings on preventive medicine and guides to a healthy regimen. ‘Self-help’ guides, focusing on common topics of interest such as sexual health, childbirth, and care of children. 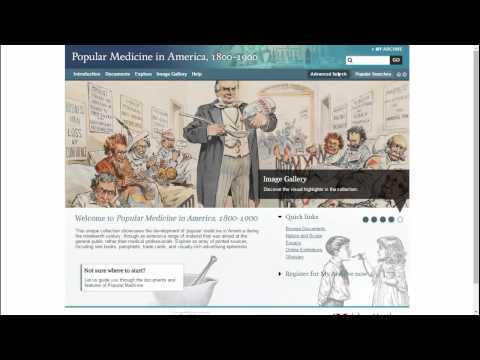 Popular Medicine in America, 1800-1900 will be a valuable resource.